Though most investor portfolios will remain heavily weighted towards traditional long-only equity and fixed income, there exist a number of investment strategies that can profit without the tailwind of rising asset prices, benefiting instead from changing volatility regimes, arbitrage events and, perhaps, an information advantage. One method to mute portfolio volatility and improve overall return may be an allocation to managed futures. When some investors are guided towards Commodity Trading Advisors (CTAs) alarm bells go off as they envision large exposures to energy, metals or currency, to which they already have abundant exposure (or at least sensitivity) in their portfolios, or of gold, which is clearly hit or miss depending on perspective. Investable commodities for CTAs, however, can include anything from cocoa to corn and lumber to rubber. These commodities managers may in fact benefit from a distinct advantage over their equity and fixed income peers – that is they seem to have a credible information advantage. Whilst a difficult pill to swallow is that one investor has acompetitive advantage in understanding Apple or Google over another, it does however sound plausible that a seasoned futures trader can better interpret the shape of a curve, opportunities associated with contango and potential pitfalls of negative roll yield relative to many other investors. These buzz words – cost-of-carry, contango and roll-yield – often materialise in the mouths of the investment community at large but are perhaps difficult for some to comprehensively dimension if taken to task. In any event, the commodities space is clearly less crowded than that of stocks and bonds, though of course often more thinly traded too. Investors have long grappled with the decision whether to include managed futures in their portfolios. In a cynical and sarcastic myth-busting assault, Forbes published Frank Armstrong’s gospel of the ‘Nine Reasons to Just Say No to Managed Futures’. The gist of his argument is that managed futures have no expected return, uncertain correlation benefits, unproven history as a portfolio investment, opacity, limited access and extremely high cost. Although analysis has shown CTAs tend to be uncorrelated to equity and fixed income, they can experience large periods of drawdown that in the short-term may feel like a costly premium to pay for portfolio diversification. Another reason why investors may be put off by CTAs is that they often have lackluster returns relative to stocks and bonds during strong bull markets. This has been particularly acute over the recent long-running rally. And in the eyes of many investors, whether or not CTAs provide insulation against inflation (some do, some do not) matters little, as these pressures are perceived by many to be a long way off. Those that do opt to make an allocation to commodities face a much debated and fundamental decision whether to invest passively or through an active manager. There are benefits to each approach, but an allocation to an active manager over a passive structure seems to have more pros than cons. Certainly an ETF will have lower cost and probably preferred liquidity terms, but a highly skilled manager should more than compensate with intimate knowledge of the commodities markets and greater flexibility of investment in a market where knowledge and flexibility truly matter. With commodities, where value can be greatly impacted by a multitude of factors – including profoundly difficult ones to forecast like weather – the ability to dynamically change trading strategy and direction is crucial, as it offers abundant profit opportunities for seasoned traders. A current tangible example exists in raw sugar where “a four-year supply surplus bear market (from 2011) has ultimately led to a supply malaise,” says Oliver Kinsey, Portfolio Manager at Ballymena Capital. With robust annual demand growth, the supply shortfall has been further exacerbated by the historic El Nino weather event in 2015 that clipped as muchas a tenth of the potential crop of both. A weak monsoon in 2015 has further reduced plantings in India, which could turn the world’s second largest producer into a structural importer over 2016-17. Current conditions present unique opportunities for the right trades but also call for careful exposure management and nimble reallocation among strategies as conditions change. ETFs and index funds tend to be long only and are often required to hold a certain portion of their assets in each futures market regardless of the fundamental drivers of the spot commodity price. They typically are structured to hold long positions in the near-dated contract, regardless of the shape of the curve and the size of the positive or negative roll yield. Timing of the roll of a contract can have a very significant impact on performance, and passive structures tend to be very mechanistic. Active managers, on the other hand, are at least theoretically advantaged from greater degrees of freedom in their selection of contracts. They have the mandate to make short (bearish), market-neutral or long (bullish) investments and will attempt to strategically roll their positions at a date other than that of the index rolls, thereby greatly reducing the market impact of their maneuvers. Long-term allocation to CTAs can improve the risk-adjusted performance of typical investment portfolios. This is partially due to low (or even negative) correlation between managed futures and traditional long only equity and fixed income investments that dominate most investors’ holdings. Over the past 10 years, for example, CTAs have demonstrated no correlation to stocks and bonds, registering -0.07 and 0.13, respectively, to the S&P 500 and Lehman Aggregate Bond Index. This decorrelated return stream can lessen overall portfolio volatility and recent history has shown that CTAs can fare well during the most troubled times for the broader markets. 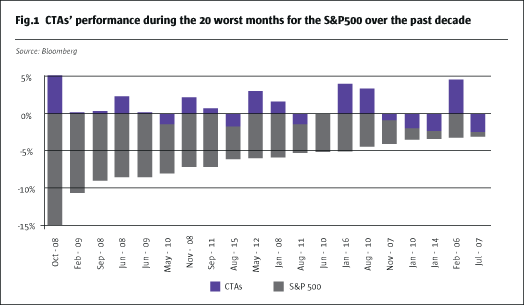 They have, for example, posted positive results during – eight of the 10 worst and 12 of the 20 largest – monthly declines for the S&P 500 over the past decade. Because loss from exposure to the stock market is generally the largest contributor to a typical investor’s drawdown, it follows naturally that CTAs have delivered some level of portfolio insurance to many investors who have embraced them. A simple analysis of the impact of adding a 10% allocation to CTAs to a stereotypical institutional portfolio made up of 35% equity and 65% fixed income establishes striking results. The portfolio, which includes CTAs, had significantly improved risk-adjusted returns over the traditional stock and bond portfolio with an increased return of almost +1.5%, reduced volatility of more than -0.5% and a +15% improvement in Sharpe Ratio over the past 10 years. The same assessment, but limited to the financial crisis of 2008 (January 2008 through February 2009), reveals that although the CTA allocation was insufficient to swing the portfolio near profitability, it did diminish drawdown by -3% and shaved off about -1.25% of the overall volatility. Because CTAs were profitable – seven out of the 10 worst and 11 out of the most difficult 20 – months for the hypothesised portfolio, their inclusion greatly improved the overall result. Ben Funk is an investor, entrepreneur and senior advisor to investment management firms. Previously he was a founding member of Liongate Capital Management where he served as Managing Director until his retirement after the firm’s acquisition by Principal Global Investors. Funk has been named by Institutional Investor as a “Rising Star of Hedge Funds” and is a regular contributor to the financial press. Funk was formerly at Morgan Stanley. He earned a Bachelor of Arts from Purdue University and was awarded his Master of Research and PhD from London Business School.